Natural and human-caused disasters strike with little notice, leaving survivors with immediate and long-term behavioral health needs. According to the World Health Organization, as many as one in five people will require psychological first aid during or after a disaster. For responders, access to behavioral health resources is critical to their ability to provide quality support to survivors. In an effort to reduce the behavioral health impact of disasters on America’s communities, the Substance Abuse and Mental Health Services Administration (SAMHSA) developed a Disaster Kit, which includes 28 evidence-based materials on disaster behavioral health response. To date, the SAMHSA warehouse has shipped over 52,101 Disaster Kits, revealing the high demand for these resources. According to the World Health Organization, as many as one in five people will require psychological first aid during or after a disaster. For responders, access to behavioral health resources is critical to their ability to provide quality support to survivors. Recognizing the trend toward digital resources, SAMHSA requested that IQ Solutions explore the utility of transforming its hard-copy Disaster Kit into an interactive mobile application. IQ Solutions engaged in formative research and interviews with subject matter experts and end-users from across the U.S. Department of Health and Human Services, the Federal Emergency Management Agency, the American Red Cross, universities, and state health departments. The research revealed that hard-copy products are cumbersome; shareable digital materials on a smartphone are preferable; and local resources and responder privacy are crucial. Under a contract to SAMHSA, IQ Solutions acted on that data to develop the SAMHSA Behavioral Health Disaster Response App. The new app features resources from the original Disaster Kit, in addition to SAMHSA’s Behavioral Health Services Locator and information about psychological first aid, responder self-care, and more. All content can be pre-downloaded in case of limited Internet connectivity at the disaster site. The SAMHSA Disaster App has been downloaded 8,221 times since it launched in January 2014 across broad platforms, i.e. iPhone®, Android™, and BlackBerry®. 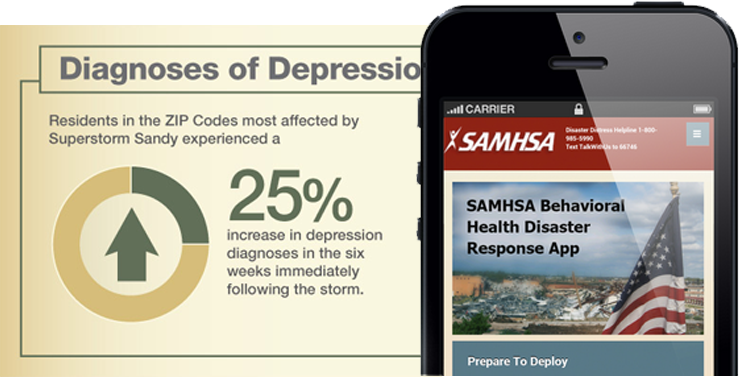 In addition to increasing access to much-needed behavioral health resources, the SAMHSA Disaster App has also significantly reduced the long-term cost of producing printed disaster response materials. 2013 data indicate that each Disaster Kit costs $8.99 to collate and ship. The 8,221 mobile downloads of SAMHSA’s disaster resources has translated to a savings of $73,900. to date and promises to continue to significantly reduce print and shipping costs. The SAMHSA Disaster App has been recognized with a Silver Web Health Award in the mobile category from the National Health Information Center in June 2014.